FGC BOLSA - FGC FINANCIAL MARKETS INFO: State Quarterly Personal Income, 4th quarter 2018 and State Annual Personal Income, 2018 (preliminary). State Quarterly Personal Income, 4th quarter 2018 and State Annual Personal Income, 2018 (preliminary). For the nation, earnings increased in all 24 industries for which BEA prepares estimates (table 4). Earnings growth in three industries—professional, scientific, and technical services; health care and social assistance; and construction—were the leading contributors to overall growth in personal income. Property income (dividends, interest, and rent). Property income increased 4.9 percent in 2018, after increasing 4.7 percent in 2017. The percent change in property income ranged from 6.0 percent in Washington and Utah, to 3.3 percent in New Mexico (table 2). Personal current transfer receipts. Transfer receipts increased 4.2 percent for the nation in 2018, after increasing 2.9 percent in 2017. The percent change in transfer receipts ranged from 9.3 percent in Alaska to 1.7 percent in the District of Columbia. Fourth quarter personal income. 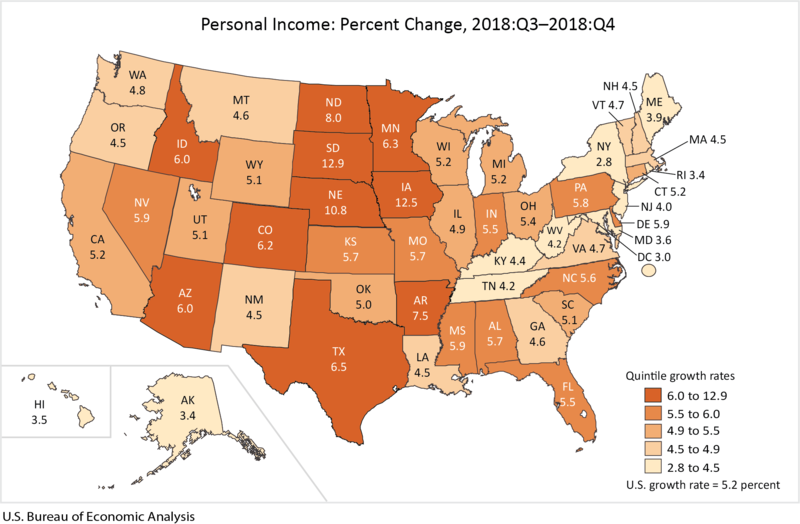 State personal income increased 5.2 percent at an annual rate in the fourth quarter of 2018, after increasing 4.4 percent in the third quarter (table 5). 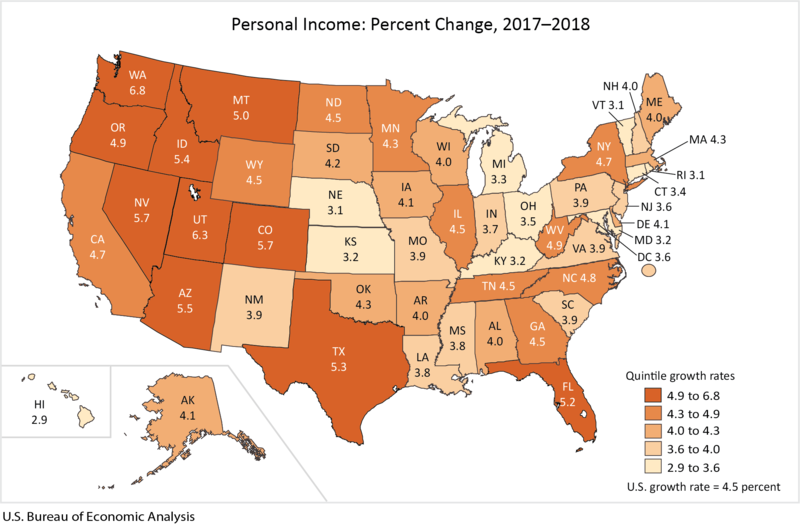 The percent change in personal income across all states ranged from 12.9 percent in South Dakota to 2.8 percent in New York. Earnings increased 5.1 percent nationally and was the leading contributor to growth in personal income in every state (table 6). Updates to Personal Income. Today, BEA also released revised quarterly estimates for 2018:Q1-2018:Q3. Updates were made to incorporate source data that are more complete and more detailed than previously available and to align the states with revised national estimates. BEA also released revised quarterly estimates of population and per capita personal income for 2010:Q1-2018:Q3, and revised annual estimates of population and per capita personal income for 2010-2017.